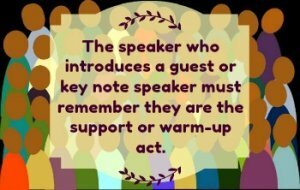 If you've been asked to give the introduction speech for a guest speaker follow the tips below, step by step, and read the example. When you're through preparing your own you'll have a speech you'll be proud to deliver. Let's start with the purpose of the speech. Essentially you are the warm-up act. Your task is to focus and unite the audience, to prepare them for what is to come. If you've done your job well your guest speaker begins without having to establish their credibility or reason for being there. Do make sure you can say their name properly and easily! If you're in doubt get the correct pronunciation from your guest speaker and practice. Sometimes you'll be given what the guest speaker wants said about themselves. If that isn't provided select events, achievements and qualifications to support establishing him/her as an authority within the context of the occasion. And do check that your guest is happy with what you are preparing to say about them. a surprise to delight the audience, something that is not commonly known, and something revealing the personality or humanity of the person. Build excitement or interest by piling one piece of information after another. Make the name of the speech (presentation) and the speaker, the climax and end of your speech. The setting for this fictitious introduction speech is a conference for an organization called "Women in Leadership". The audience are primarily women drawn together through an interest in leadership roles. At the end of the speech, the speaker will lead the clapping as Rose Stephenson, the person being introduced, takes center stage. "She's been a stalwart member of "Women in Leadership" for the last ten years. Over that time she's served in every office: secretary, treasurer, chairperson, chief fundraiser, education officer to name a few and in some roles several times over. Her passionate dedication to promoting public speaking as an important component of empowerment is inspiring. We estimate that she has personally mentored at least 100 new speakers and has set an extraordinary "yes, you can" example for many more. Yes, she was temporarily paralyzed, struck dumb by the mere thought of standing in front of an audience to speak. How she got from awkward tongue tied silence to an eloquent front line spokesperson is the story she will share with us tonight. 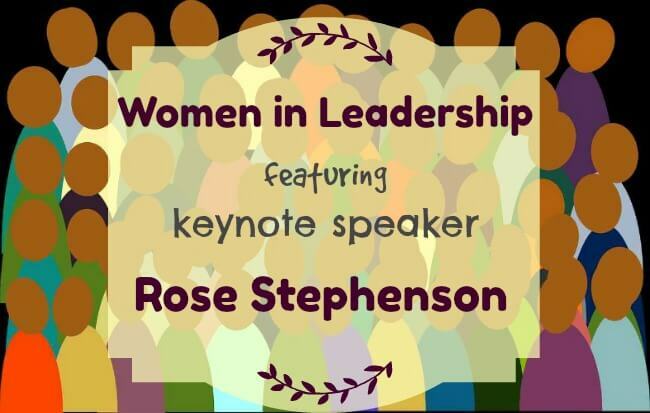 Ladies, I give you ... Rose Stephenson on speaking to lead." Say the speech out loud! Use it as a template! Try saying it out loud to get the flow of it. If you like it, use it as a model for the introduction speech you need to write. Is what you've prepared appropriate for the occasion, audience and your guest speaker? Have you avoided cliche? 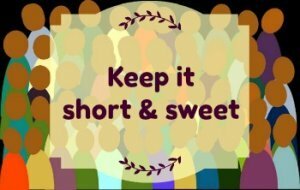 Pertinent and pithy - short and sweet is what you want. One to two minutes should be enough. Test it out loud with a timer and trim if necessary. You don't want to talk about your guest in a way that may embarrass them or cause the audience to question their right to be there. Beware the horror of getting your facts muddled and, if you wish to mention something that may be sensitive, ask permission before you announce it in front of an audience. 5. Remember you are not the star of the show! Cover only enough in your introduction to make the coming speech eagerly anticipated. 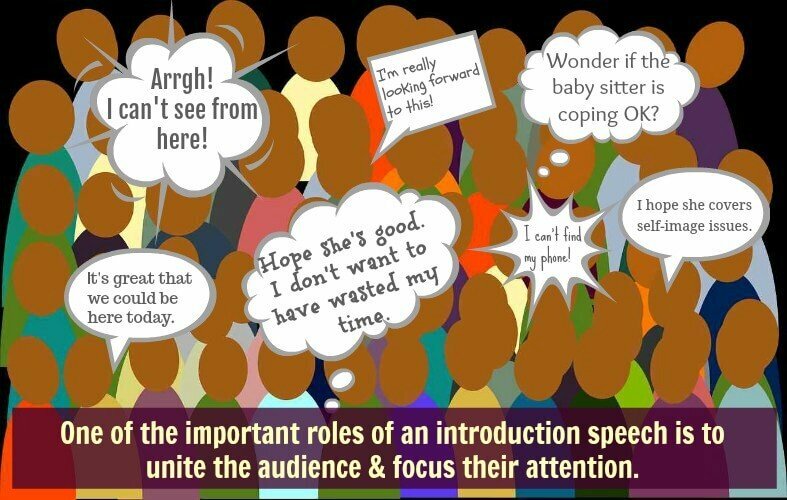 Do not stray into telling the audience what the guest speaker's speech will cover in detail. That's unfair! Practice out loud until you are confidently fluent and able to convey the pleasure or enthusiasm the audience needs to get them in the right frame of mind.